It has been discovered that a security guard in Federal Government Girls' College (FGGC) Langtang in Plateau State pimps female students out to strangers for N5,000. An investigation carried out by The Cable yielded this shocking finding.It also led to the discovery that male teachers are known to summon female students into their offices during night prep, between 7 p.m. to 9 p.m. Teachers claim to be aware of this but say they have no evidence to implicate the offenders. FGGC Langtang is a girls boarding school with little. 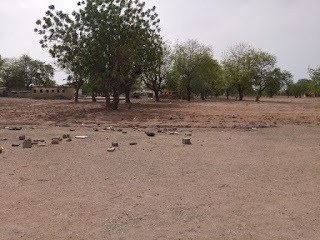 The school's hostel has no fence such that it is very easy for strangers and locals to gain access to the hostel without being challenged. Local residents now walk through the school as shortcuts to their homes and strangers gain easy access to the hostels. The reporter who went undercover to uncover what has been going on in the school was able to enter the girls’ hostel without any restriction. The reporter got in contact with the security guard employed to protect the students but opted to make extra money on the side by pimping the senior students out, and he was more than willing to provide the girls for a fee. The reporter was able to get the guards phone number easily because it is common knowledge amongst men who have needed him to provide girls for them when they are in Langtang. The guard gave assurances that getting girls out of the hostel "is no big deal". Bani Guest House, a popular lodge along the Langtang highway, is well known to the girls, the guard said. He explained that most of them attend Sunday evening parties at Bani, where their boyfriends come to wait for them. When the reporter who disguised as a businessman met the guard, he told him that the girls in SS3 who were rounding off their final exams would make the perfect picks. "I am giving you outgoing students," he said. "There are some writing exams, it’s just to get a clue to know them and ask if they can do this for me. There are girls who do ‘runs’ but the issue is money." The guard, who then requested for money so he could move around and also "sort out" the girls’ transportation, revealed that there are a couple of schoolgirls who are into the act of sneaking out of the school premises. The N5,000 was solely for the guard while the girls bargained with the customers after they've been pimped out to them. "You’ll discuss how much you’ll give them," the guard told the reporter as he pocketed the N5,000 given him as upfront for the task. "All those girls are small girls and they don’t know money much. If you treat them well, they will look for you if you’re still around." The guard had left his duty post. For hours, he was moving around the school, searching for girls who could be available under the tight deadline. "I have arranged two girls now, and they will come to meet you when they are done with their exams today," he later told the reporter over the phone. The girls couldn't make it eventually because they wrote their papers late and feared coming out of the school could jeopardize the other papers the following morning, the guard explained. He assured the reporter the girls would turn up after writing the day’s papers but at this point, the reporter decided to abort the mission for professional reasons. One of the newly graduated girls, who later spoke with the reporter, said this particular guard is the go-to man pimping girls to strangers. The girl said: "He used to be a kitchen staff. He impregnated one of the girls in the hostel, you know the hostel is close to the kitchen, and I think as a punishment, he was moved from the kitchen to the gate." One of the officials of Langtang’s old girls’ association disclosed that a year ago, they heard that girls were being pimped, but they could not substantiate the allegation. The lady who spoke on the condition of anonymity said: "The pimp, we were told, wasn’t even a security guard but one of the male teachers. We have tried to investigate but we couldn’t find anything. We confronted the former principal — who is now retired — with this and she said there was no such thing going on. There was a specific teacher allegedly doing this with SS3 girls but no one could give his name or any useful information in getting to the root of the matter." She added: "We even got a girl whom we were told knew this pimp, and when we called her, she denied knowing a thing. So, we had to disregard the rumour, because if you tell us something is happening, you should be able to give us the needed information to work with. If we had a name at least, we could have done something covertly with some of the old girls who now teach at the college, and our Jos chapter could have shown up in the school unannounced." One of the graduating girls said she is not sure if girls are being pimped to strangers, but she knows at least three members of staff whom she claimed made sexual advances to the girls. She said: "One teacher used to call girls to his office in the night. But, I don’t know what he used to do with them. One of the girls told us that when she went to his office, he only asked her out and that when it’s weekend she would follow him to his house." Another teacher, it was alleged, would call girls to his office in the night, and it is not clear what he did with them. "It is during prep time, 7-9pm, that we see girls going to the teacher’s office," the graduating student said. She named all the teachers involved, but for legal reasons, TheCable chose to withhold their identities. The girl further disclosed that at the ICT department, where girls go for biometrics for examination purposes, the man in charge — under the pretence of guiding them — would touch them sexually. "That one will be touching girls’ breasts and buttocks," the girl said. The ministry of education, which directly supervises Federal Government Colleges, says it is not aware of the allegations of pimping at Langtang. The director of press at the federal ministry of education, Chineye Ihuoma told TheCable: "If you have any proof, the best way is for you to write us formally and we will conduct proper investigations. But, how can a security man in the school be pimping girls to a stranger? Though pimping out girls and sexual harassment is no secret in the school, no one wants to speak for fear of the resulting backlash either. Hence, the question, "How can?" continues to come up, thereby preventing further investigation into the case and corrective measures to stop and revert the decay in the school. Asides the sexual harassment that goes on in this once prestigious institution, there are other problems the school faces and that includes the problem of insecurity and lack of infrastructures. The hostel has a broken fence and no protection from outsiders. Also, the students lack clean water.There is only one borehole in the hostel area hence students use water from an untreated well. They also sleep on broken beds and study in hostile classrooms while sitting on benches. Speaking of the lack of security, a member of staff said: "People walk through the school premises unchallenged. "It has become a shortcut for staff and people who now walk through the school to the main road and or their houses. And sadly, there are some boys who come in through the unfenced area to steal items from the girls’ lockers." One of the students said that some adventurous girls sneak out through the unfenced area to attend parties and meet with boyfriends in town. Another student said: "Students are not allowed to go out of the school when in session, but the stubborn ones do sneak out to attend parties. They go through the back-of-school because there is no fence, but some go through the gate because the security is not so tight." Officials of the school were unwilling to speak on the record, instead, they directed the reporter to speak with the Ministry of Education in Abuja. "I am a civil servant. I would advise that you speak to the ministry of education in Abuja," Laura Dogo, the new principal, said when asked to comment on the various issues.